Materials 1) Sketch the shade to use as a guide for ring locations, step 7. 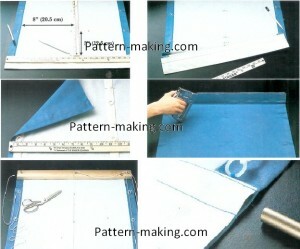 Cut shade fabric; seam for width, if necessary. 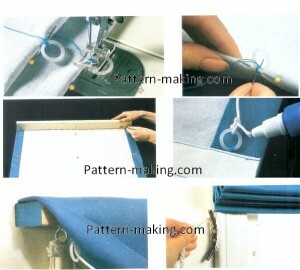 If fabric ravels, finish side edges with zigzag stitch or liquid fray preventer. 2) Place shade fabric wrong side up on work surface. Mark finished width. Press I l/2″ (3.8 cm) side hems. 3) Place lining on shade fabric, wrong sides together. Slip lining under side hems. Smooth and press lining. Pin in place; slipstitch, if desired. 4) Center and pin facing strip on right side of shade, even with lower edge, with I” (2.5 em) extending at each side. Stitch l/2″ (1.3 cm) from lower edge. Press toward wrong side of shade. 5) Fold and press facing extensions to back of shade so they do not show on the right side. Fuse or stitch in place. 6) Tum under raw edge of facing I l/2″ (3.8 cm);turn under again 3″ (7.5 cm). Stitch along folded edge. Stitch again, I” (2.5 cm) from first stitching to form pocket for weight rod. 7) Mark locations for rings with horizontal and vertical rows of X’s. First, mark outside vertical rows I” (2.5 cm) from shade edges so rings hold side hems in place. Space vertical rows 8″ to 12″ (20.5 to 30.5 cm) apart across shade. Position bottom row just above the rod pocket. Space horizontal rows 5″ to 8″ (12.5 to 20.5 cm) apart. (8) Pin through both layers of fabric at center of ring markings, with pins parallel to bottom of shade. Fold shade in accordion pleats at pins to position shadefor machine or hand stitching of rings. If using ring tape, omit steps 9a and 9b. 9c) Use ring tape instead of rings, if desired. Turn under W’ (1.3 cm) at bottom of tape and place at top of rod pocket. Pin tape to shade in vertical rows,lining up rings horizontally. Stitch both long edges and bottom of tape with zipper foot, stitching all tapes in same direction. 10) Staple or tack shade to top of mounting board. If shade is mounted outside of window frame, paint or wrap the board with lining fabric before attaching shade. This gives the shade a finished look. 13) Cut lengths of cord, one for each row of rings. Each cord will be a different length; cords go up the shade, across the top and partway down one side. String cord through rings and screw eyes, with excess cord at one side for pulling. 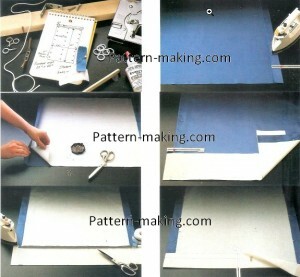 14) File ends of weight rod or cover ends with tape. Insert rod into rod pocket and slipstitch ends closed. A galvanized or iron rod, painted to resist rusting, can be used instead of a brass rod.